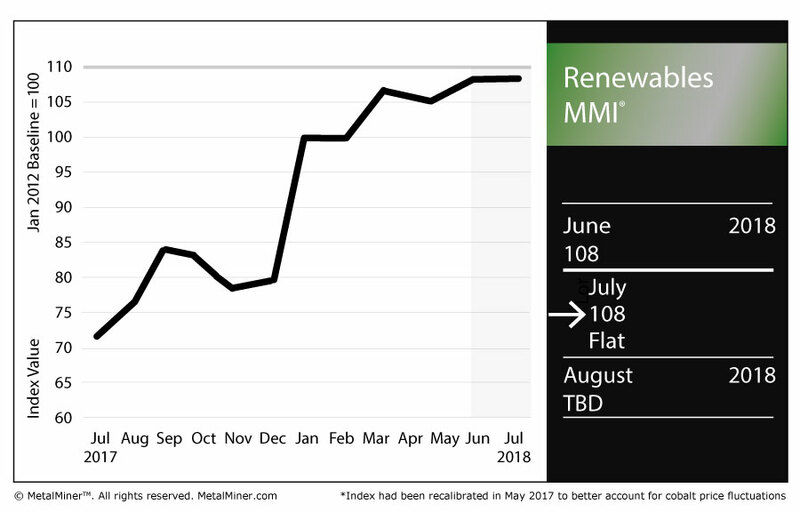 The Renewables Monthly Metals Index (MMI) held steady this month, coming in for a reading of 108 for the second straight month. Cobalt prices are notorious for being both high and incredibly finicky given the relative scarcity of supply (not to mention the fact that the majority of the world’s cobalt is mined in the Democratic Republic of the Congo, which has been plagued by political instability, violence and concerns regarding supply-chain ethics). With that in mind, it might be news to some that the cobalt price has drawn back from record highs of late. According to one Bloomberg report, that is good news for those looking for an in to the market and, subsequently, a chance ride the electric vehicle (EV) demand boom. Per the report, cobalt sulfate has dropped more than 20% since April. As China continues its efforts to battle rampant pollution in the country, so, too, continues the EV demand apace. According to the report, the country already is responsible for more than half of global EV sales. Sticking with the cobalt theme, Reuters reported Brazilian miner Vale has reached a deal with two Canadian companies that will, ultimately, lead to the sale of the coveted metal from the Voisey’s Bay mine in Canada (in the province of Newfoundland and Labrador). According to the deal, Vale will receive an initial cash payment of $390 million from Wheaton Precious Metals Corp and an additional $300 million from Cobalt 27 Capital Corp.
Japanese steel plate fell 1.7% month over month to $722.52/mt. Korean steel plate rose 3.8% to $672.43/mt. Chinese steel plate dropped 2.5% to $739.87/mt. U.S. steel plate, meanwhile, traded flat, sticking at $937/st. U.S. grain-oriented electrical steel (GOES) coil surged 17.8% to $2,915. 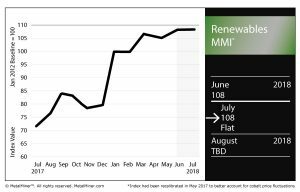 Chinese cobalt cathodes fell 3.3% to $100,411/mt.